Is this Fire Emblem’s last 3DS outing? If you’ve lost track of the Fire Emblem series, then Echoes: Shadows of Valentia isn’t likely to put your confusion at bay. Back in 2013, developer Intelligent Systems released the frighteningly good Fire Emblem: Awakening, but then last year saw the release of the equally fantastic Fire Emblem Fates. With three different versions of the game available – Birthright, Conquest, and a downloadable content pack called Revelations – the Fire Emblem series became complex. Now, Intelligent Systems is releasing Echoes: Shadows of Valentia, which isn’t a new game at all. Instead, it’s a full remake of the 1992 Famicom game, Fire Emblem Gaiden. This is a reminder of just how long this esteemed series has been going – but it’s refreshing; unlike reboots and remasters, full-blown remakes are rare these days. It may be a remake of a quarter-century-old game, but Shadows of Valentia retains the core strategic mechanics that Intelligent Systems has been honing over that time, which means you can jump right in even if you’ve only played Awakening or Fates. It’s also a wonderful reminder of just how great the 3DS console is in the right hands. This is a fabulously well-made game – from its looks to the voice work, to the implementation of its strategy – despite the overtly limited controls of its handheld hardware. Much like Fire Emblem games of old, the strategic turn-based battling is wrapped up in a big-stakes story with a likeable cast. 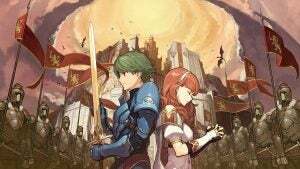 In this instance you play as two different characters, Alm and Celica, who are lifelong friends who find themselves on opposite sides of the same huge war. This is where Shadows of Valentia gets plenty right, delivering a load of great characters and offering up some fantastic narrative set pieces. It helps that the writing and voice work is standout throughout, with its actors delivering moments of heightened emotion and fraught tension super-effectively. Up against the likes of Legend of Zelda: Breath of the Wild, Shadows of Valentia emerges looking superior where dialogue is concerned, and the fact that all of it is voiced is also impressive. The story isn’t the best, though, and it takes far too long to get going. The dynamic between protagonists Alm and Celica is pretty interesting, as is the relationships between all of the game’s cast, but the first eight or so hours are slow. Fans of Fire Emblem will also be used to the ton of different names that get thrown at you as you work through its story, and Valentia is no different here. Thankfully, it’s clear that the story isn’t the main attraction. Instead, the interplay between its characters as you take them through genuinely tense battles is what makes Fire Emblem such a moreish handheld experience. Strategy starts pretty easy, easing you into the basics of movements and attacks, but it can quickly overwhelm you as it introduces tougher enemies and environmental considerations. Even on its standard difficulty – there’s a Hard mode for those with a death wish – Shadows of Valentia destroyed me several times, forcing me to restart battles and always managing my saves. And much like XCOM’s ingenious Ironman mode, Fire Emblem allows you to be sadistic and turn on permadeath, which potentially makes every battle the last for all of your recruited teammates. I played without permadeath, but even then I found the game’s balance of challenge and satisfaction pretty ace. I also recommend tweaking the settings for battles, turning up the speed and adjusting the options to your liking – they’re extensive, which is welcome in a game such as this. If I have one main criticism about the battles, it’s that the game’s large maps are often far too visually bland to justify the enormous landmass on which they take place. I found myself spending quite a lot of time just moving towards an enemy, rather than fighting them or manoeuvring into interesting strategic positions – and there’s never much variety. What does help with the samey maps is the new dungeons feature. Valentia takes place on a big overworld map, where you move forward and backward on a predestined path. However, you’re now able to enter optional dungeons that let you explore on foot in real-time, even entering into shorter, smaller battles if you bump into an enemy NPC. These battles are pretty great, even if the dungeon exploration itself is a little undercooked, feeling like speedier, bite-sized encounters. There are also small hub locations, which let you move from space to space, talking to characters in a particular area. This is where you’ll recruit some of the more peripheral cast members, and become involved in the more optional conversations. Overall it works well, and feels like Professor Layton’s explorative segments have been wedged into the traditional Fire Emblem structure to provide some much-needed downtime between battles. Despite its strategic depth and craft, you can’t help but feel that Fire Emblem has had its run on 3DS. This isn’t a criticism per se, and it’s more remarkable now than ever that the handheld console with a low-rent screen and barely any processing power is still able to churn out such deep and engrossing experiences. Intelligent Systems is likely looking to Nintendo Switch for its next big strategic adventure – but for now, Shadows of Valentia is great enough to warrant dusting off your indestructible little pocket toy for one last hurrah. The post Fire Emblem Echoes: Shadows of Valentia Review appeared first on Trusted Reviews.